So I've signed in again for NaNoWriMo. That's me there. You can keep an eye on my word count if you like. Please don't harrass me too much about it though! After numerous divination techniques I still don't have a plot. Moreover, I don't think Abbey would be impressed if I tried to postpone her birthday party. Plus all that holiday stuff I need to get onto. Yikes. I'll make sure to tell you all at exactly what point I give up. 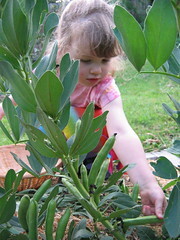 The Mysterious Plant, or, Do Me a Fava and Get Rid of Those Beans. There are often odd little plants that pop up in our garden, largely because I garden in a lazy and experimental fashion. Something new appears and I give it the benefit of the doubt, waiting to see what it turns out to be. I call it the "It Doesn't Look Like a Weed" Theory. So when two green seedlings grew out of an otherwise unoccupied garden bed I did the only natural thing: Avoided pulling them out. They grew cute little purple and white flowers. So far so good. I was told they must be peas — we've had them appear before due to using pea straw as mulch, but these were no pea. A couple of days ago I noticed long green pods on them. "Ah, well, they must be peas," I said, and promptly ate a couple. Tasty. I noticed they were much embiggened today, so I opened another pod for inspection. Considering there are only two vegetables that I was scarred with as a child*, I was not happy with what I saw, but sure enough they were broad beans. Can't let a free veggie go to waste however, and I can't imprint Abbey entirely with my own tastes, so we picked a handful to have with dinner. Abbey shelled them as I got the rest of the meal ready. They were young, so I just boiled them for five minutes. Then the ultimate test. Not bad. They are certainly a very savoury bean. None of the sweetness you get with a young pea or green bean. Not going to become a favourite, but bearable. So I put my previous experiences down to having older, tougher beans as a kid. Abbey was very keen to eat them. Didn't even want to wait until they were cooked. Once dinner was served she ate two. Then she said she was saving the rest and ate everything else. "Later", she said, "For a special treat. Dessert." Finally when the rest of her plate was scraped clean and only a tiny pile of bright, grey-green beans remained, she pushed the plate away. "I don't like them." Vindicated! I knew it! Guess what's getting "weeded" tomorrow? *The other being brussels sprouts. M1k3y puts us onto these excellent music videos by Sil van der Woerd. dark palette + (nature and/or technology)/atmosphere = pretty. Been moving the furniture around today in preparation for carpet cleaners tomorrow. It's kind of like moving house, but without the excitement. I have a dust-induced headache, but I can't complain about that when to entertain me is a near-four-year-old girl who alternately today threatened to exterminate me and left for the moon in her TARDIS as Doctor Who. It's been fabulous really. In less than twelve hours this Doctor person has become a catch-all hero for the household. "Time for Doctor Who to brush her teeth", "If you don't eat another mushroom you won't know how to operate your sonic screwdriver", "Doctor Who is very friendly. She certainly wouldn't beat me over the head with a pink balloon." All this stemming from a glimpse of a Dalek animation on Danny's blog! Shiny Issue 1 - Read it! I've written a review of the first issue of Shiny magazine, and it's available to read at ASiF! Which story did I like the best? What are the biggest challenges facing Twelfth Planet Press? What is the one thing this magazine is lacking? Read on to find out! Then you should go buy a copy. It's only $3 for three great stories and the warmth that comes with supporting small press and start-up projects. So here is my Conflux experience as filtered through other people's reports. Cat Spark's gets the negatives out of the way early on by bitching about the lack of basic competence by the hotel staff. Emma gets into the nitty gritty of panel attendance. Cat wins the prize for photo-taking at Conflux. (You may have to hunt, but I'm in there a few times.) And there are pics of the costumed Banquet-goers here. Most comprehensive is that almost all of the panels are available as podcasts from the Conflux website. Including the one I am on. I can't verify the quality of them yet, but I will definitely catch up on the Guest of Honour interviews and speeches that I missed. Other than that I bought a lot of books, then turned around to get everyone present to sign them (nerd!) and attended a couple of workshops run by Kevin J. Anderson and Rebecca Moesta who were sadly stricken by a tour-induced lurgy but who brought the goods anyhow. It was a pretty neat con. Very writerly, which didn't bother me so much as other people, but best of all, it was friendly. I had some great conversations with old friends and new ones. Mission accomplished! Theatre Review - I Like to Sing! I know you're all waiting with baited breath to hear what I have to say about Conflux, but first you're going to have to put up with, yep, that's right — more Justine Clarke. Abbey and I went to the concert last Wednesday and it was excellent. Absolutely everything you could want from a touring kid's show. To adapt the CD to a live performance it has been written into a loose narrative of what Justine does in her backyard on a hot summer's afternoon. In this way they managed to include, I think, every tune from I Like to Sing! The set was simple but effective, the props were minimal, but again effective and, following the Playschool philosophy, there was absolutely nothing that you could not recreate in your own home. Justine was marvellous. Her performance was enthusiastic and engaging. Several times she walked through the audience asking the kids questions and really listening to their replies too. Far from juvenile or sappy though, there were a couple of lines directed to the adults as well. "I'm a tree," she said waving her arms wildly over her head, "Can you all be trees too? I've been to drama school, I know how to be a tree." There were just two others on stage, Peter Dasent, writer of the I Like to Sing album and resident Playschool pianist, and Jeremy Cook a versatile percussionist. Both participated in the storytelling, being the straight guys for jokes, wearing daft hats and of course providing all the backing music. We both had an absolute ball, as did the rest of the crowd. But the most reluctant to let them leave the stage were the five and six year old boys who ran down to the front row in order to lean on the stage and make doe eyes at Justine.